Can you think of one good reason to not have a birthday party for your dog this year? We didn't think so! She showers you and the family with unconditional love, affection, and loyalty, so why wouldn't you want to shower her with some doggy-approved desserts and gifts?! Read on for some easy–and adorable–ways to make your dog's birthday pawty memorable. Let's face it: Our dogs are spoiled every single day, but their birthdays are actually a legitimate reason for some serious doggy spoilage! Whether your pooch prefers tennis balls, Kongs or softer, homemade toys, there's no better reason than her birthday to hit up the toy aisle at your pet store. Another fun (and hilariously adorable) idea? Put her a in a room with a ton of tennis balls and watch the excitement ensue. You've helped your friends and family decorate for a million birthday parties–so why wouldn't you decorate for your precious pooch's birthday? 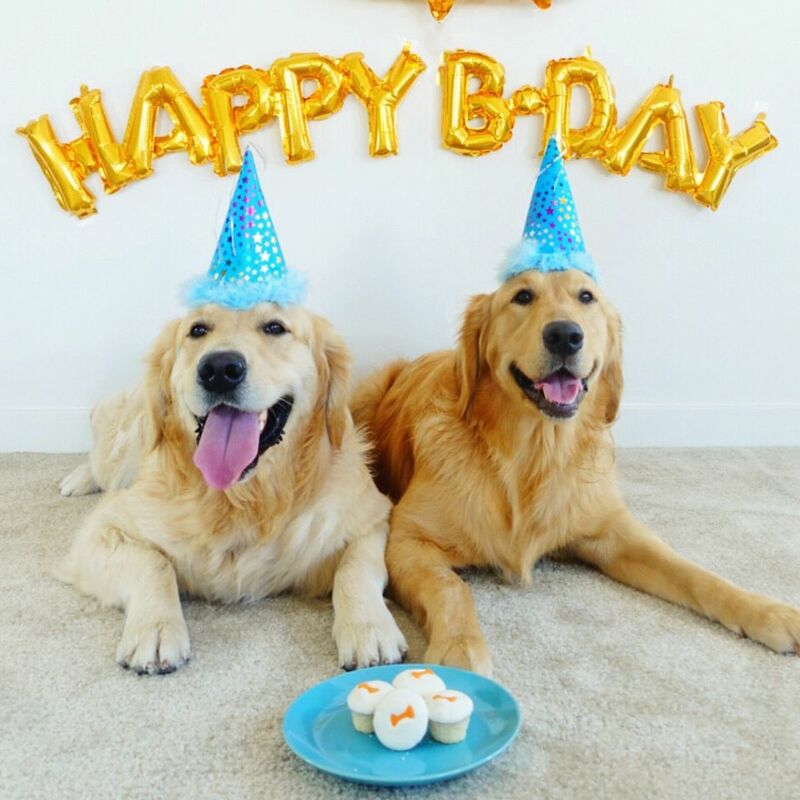 Balloons and streamers are standard birthday party decor, of course, but there are tons of doggy-themed ways to do it up, too. Make a cute, bone-shaped banner with construction paper and yarn or twine, toss dog-friendly confetti on all of the tables and–if you're a little bit more crafty–make a chalkboard sign with the drink and snack menu. If you're not super crafty, you can buy adorable, doggy-themed banners online, too! Believe it or not, lots of dog-friendly birthday cakes are human-friendly, too. All you need are some everyday baking ingredients–like whole wheat flour, baking soda, eggs and applesauce or baby food–to make an amazing canine cake. Blend in shredded veggies, like carrots, for a boost of nutrients, and top it with cream cheese, peanut butter or blended bananas. Don't feel like breaking out the baking gear? We don't think any dog has ever turned down peanut butter paired with his favorite treats. Although real ice cream isn't great for your dog's gastrointestinal tract, it's easy to whip up some puppy-approved ice cream at home with ingredients you probably already have in your pantry. Blend bananas with plain yogurt and creamy peanut butter, then freeze overnight to get the right consistency. Or make puppy ice pops with one basic ingredient: Chicken or beef broth! Simply pour it into a mold and freeze. There's literally nothing cuter in the world than a party hat on a puppy. It's super easy to make your own by gluing (be sure to choose the non-toxic kind) construction paper, poster board or foam paper into a cone shape. Then, decorate with permanent marker, pompoms, tassels, or any other accoutrements that will make your pupper feel extra festive. But what if your dog won't wear his party hat for longer than 20 seconds? Whip up a no-sew bandana with some cute fabric and fabric glue or hemming tape, or a no-sew tutu with elastic and strips of tulle. What's a puppy party without your dog's entire gang? Invite the crew over for a day of running, snacks and, um, sniffing in celebration of your furry family member's birth. Put out plenty of water and, if the other pet parents are OK with it, some snacks for pawty guests. Portioned dog treats, sliced frozen bananas, baby carrots, and green beans are all healthy snacks that are easy for dogs to pick up and munch on. Be sure to keep a close eye on your dog and her guests while they're playing. Even the best dog buds can have misunderstandings sometimes. Aside from an afternoon of cute dog shenanigans, you have to give your human guests some incentive to come to the puppy party, too. Enter, delicious party foods and drinks. Whip up a few party favorites like chicken wings, spinach and artichoke dip, and deviled eggs, serve beer, wine, or–if you're really into the party theme–a custom cocktail in honor of your doggy's day. Strike a paws! Make your own photo booth backdrop, grab some props (that your guests may or may not tolerate for a few seconds) and get 'gramming! Have your guests upload their photos to Instagram or Facebook with a custom hashtag (every happening event has one! ), so you can see all of the fun in one place. The best part of these dog-friendly party games is that they're actually basic training techniques disguised as fun! Make sure you have plenty of toys (and treats) for games like hide-and-seek and fetch, which help dogs practice commands like "sit," "stay," "come" and "fetch." If you really want to take your puppy party games to the next level, try a round of Snoopy Says. Like the human version, Simon Says, participants listen to commands and make certain movements. The last pupper standing wins! What's a birthday party without a jam-packed favor bag? Include some small toys, like a tennis ball or chew toy, a handful of dog bones or jerky sticks, a party hat or bandana and, of course, some on-the-go treats for the humans, too.